Joseph William Burk was born in Philadelphia on January 19th, 1914. He entered the University of Pennsylvania as a member of the Class of 1934. During his sophomore year, young Joe took up rowing under coach Rusty Callow. Although Burk had never tried rowing before arriving at Penn, he turned out to be a natural. He became dominant in the sport in part because of the unique style he developed. Burk won the national single sculls title four times and the Canadian title three times. As captain of the Penn team during his senior season, he won thirty-seven straight races; that same year he also became the first oarsman to win the James E. Sullivan Award for the advancement of sportsmanship. To add to his already impressive career, Burk became the first American to win the Henley Diamond Sculls twice. He also broke records with his win at the centenary of the Royal Regatta in 1939, becoming the only American to win the Henley Diamond sculls twice (1938 and 1939). In 1939 he received the James E. Sullivan Award as the outstanding amateur athlete in the United States. He was set to row for the U.S. in the single sculls event at the 1940 Olympics, but his chance at winning Olympic gold was dashed by the onslaught of World War II. During the war he commanded a PT boat in the South Pacific for the Navy; Lieutenant Burk was awarded the Navy Cross, the Silver Star, and the Bronze Star for “extraordinary heroism and intrepidity in action.” His younger brother, James, who also rowed at Penn and then served as PT boat commander in the Pacific, was killed in World War II. After the war ended, Burk went to work for the American Can Company and also coached the Yale University crew team. He returned to Penn in 1951 to serve for nineteen years as coach and assistant professor. 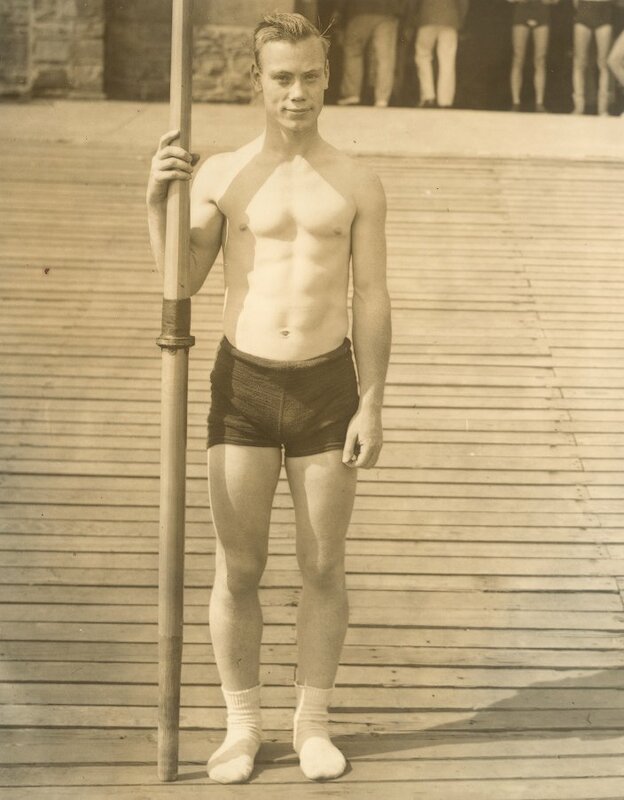 Known as a training innovator, Burk initiated weight and training programs that later became widely used, including the use of electronic equipment to measure the output of each oarsman in a crew. During his tenure as rowing coach, the Penn crew competed at Henley three times, including one Penn victory in 1955. Burk also coached the varsity eight to win the Intercollegiate Rowing Association championship in 1967 and then, in later years to two more wins — the first times since 1900 that Penn had won this championship. Burke was also a member of the 1968 Olympic Committee. After his retirement, Burk moved to Montana and then Arizona, visiting Philadelphia in 1988 to receive the premier award from his alma mater, the honorary degree of Doctor of Laws. He was elected to both the United States Rowing Hall of Fame and the Penn Athletics Hall of Fame. In 2005 he was honored with a bronze sculpture created by artist Elizabeth Doering; this sculpture now stands in front of the Penn boathouse on Kelly Drive.